Whatever good intentions Lowther might have carried in his baggage were soon dispelled when he came under the influence of Fitzmaurice; within days Lowther was privately informing Grey that the C.U.P. ‘lacked responsible leaders of position’, while, by the end of August, he was disparagingly referring to the Committee as ‘a collection of good-intentioned children.’ Fitzmaurice, while ostensibly prepared to give the Young Turks a chance, feared that if they could not check internal unrest the result might provide a perfect excuse for Russian encroachment, yet Grey had specifically ruled out any question of British intervention to uphold the new regime. Instead, Grey sent Lowther a three point plan, consisting of anodyne suggestions, and a pledge to support the new regime ‘as long as they do well’. He could often talk the Turks’ language as well as the Turk; he used the same silences and gutturals as deep as the Pashas, some of whom he had grown to respect. He was the ivy that supported the tottering Ottoman oak… Now in the place of the old pashas, with their stately presence, their high honorifics, their venerable beards, he was called upon to meet a miscellany of Jews from Salonica, of Turkish Boulevardiers, and moustachioed Syrians from Lausanne, who spoke to him, not in Turkish but in the French of Pera. Abdul Hamid’s first choice of Grand Vizier – Said – lasted only a fortnight: his cabinet contained too many of those tainted by the old regime, particularly the hated ministers of Marine and of the Interior. In Said’s place the elderly, anglophile Mehmed Kiamil Pasha was appointed on 5 August 1908 providing London with further cause for hope despite the anomaly that, although Kiamil was not disposed towards the C.U.P., yet his position would depend on the good offices of the inner circle of the Committee. Paradoxically, the revolution had come about too quickly for the C.U.P. and, once the constitution had been restored, the party lacked a definable political programme. ‘[T]he Turkish people’, Fitzmaurice condescendingly informed his confidant in the Foreign Office, ‘after their 30 years of despotism are like a 2 year old infant that can’t walk firmly and is somewhat inarticulate. They are very raw and the Gov[ernmen]t as such is none too strong. It has to lean on the League which finds that it cannot retire into the background but is obliged — to preserve from danger the liberty it has just won — to practically run the Empire — in a visible or occult form.’ In the interim, a Committee of Seven was dispatched from Salonica to Constantinople to oversee events and exert control upon the Government without itself being held to account. The most prominent members of the Committee of Seven would remain at the heart of Turkish politics until the latter stages of the First World War: Talaat Bey, Djemal Bey and Djavid Bey. Assuming that things went smoothly, Fitzmaurice warned that the Turks would develop nationalist tendencies and ‘will want to assert themselves strongly in questions such as Crete, Egypt, Macedonia, Bosnia, Aden, Lebanon, Cyprus and probably our special position at Bagdad’. But things did not go smoothly; the first real test for the regime would come in October 1908. Having left the question of the Straits off the formal agenda in his talks with the British, Isvolsky put his plan of attempting to gain a separate agreement with Austria on the subject into action. 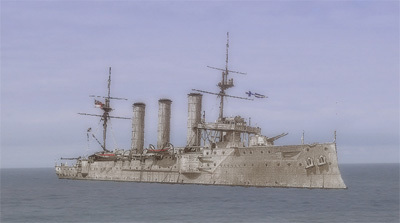 The Austrians had, for some time, been aware that the question of free passage of the Straits ‘was one of the principal aims of Russian policy.’ It was also an aim that the Austrians felt they could accommodate — as early as 1898 a senior Minister had declared that the matter was one ‘which Austria might look upon with equanimity, as it was…a question which had but little importance for this Empire.’ By a secret exchange of memoranda in May and June 1908, Austria and Russia had already defined each country’s Balkan interests in the eventuality of a break-up of the Ottoman Empire. Aehrenthal, the Austrian Foreign Minister, was much concerned by the developments in Turkey which appeared to make the prospect of the planned Austrian annexation of Bosnia and Herzegovina (nominally Turkish but administered by Austria-Hungary since 1878) a more fraught operation. 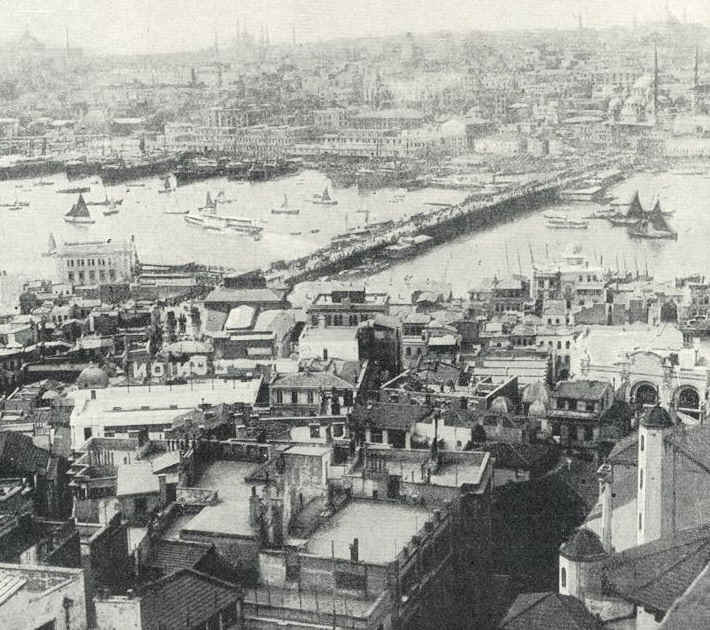 Meanwhile, after again debating on 3 August the proposition that a sudden descent should be made on the Bosphorus, the Russians saw, to their surprise, the great outburst of Anglo-French enthusiasm in Constantinople which held out the promise of a concomitant improvement in Russo-Turkish relations. On a personal level, Isvolsky believed he had the measure of the Austrian. ‘Aehrenthal’s attitude has amazed me during the past year’, Isvolsky declared. ‘I have been driven to the conclusion that, far from being a prudent and able statesman, Aehrenthal is simply an Austrian official, and clumsy at that.’ With this background, Isvolsky met Aehrenthal at Buchlau in Bohemia on 16 September. For six hours the Foreign Ministers set out their stalls: for Russia this meant turning a blind eye to the Austrian annexation, while the Austrians would support Isvolsky’s dream of having the Straits opened to Russian warships. In addition, to pacify the Bulgarians and Greeks, both of whom Isvolsky feared could defeat Turkey on the battlefield and whose occupation of Constantinople horrified him, it was agreed that Bulgarian independence would be recognized and Greece could cede Crete. With no action yet taken (Isvolsky maintained that Aehrenthal spoke vaguely ‘about the necessity of annexing the Provinces some time or other’) but the agreement supposedly under his belt Isvolsky set off on a leisurely tour of western capitals to gather international support for both the main propositions, as they would entail alterations to existing treaties. It was perhaps on this point that M. Isvolsky was exposed to the rudest of deceptions. He had assumed, and had perhaps some historical justification for assuming, that if he could procure untrammelled egress for her ships of war through the Straits he would have accomplished an act which would have been universally applauded. But he had not foreseen, and indeed it is difficult that he should have foreseen, that the Russian public viewed the Dardanelles question with comparative indifference. The current position, whereby their ineffectual Black Sea Fleet was denied egress, while the more powerful navies of other Powers were denied ingress still suited most Russians; Isvolsky had been guilty of allowing himself to run ahead of public opinion. Worse was to come in London where Isvolsky was to find that Grey was reluctant to agree to any modification regarding the Straits as he wanted to do nothing to weaken the position of the Young Turks. Senior officials in the Foreign Office had already formed a poor impression of the Russian Foreign Minister and had been warned beforehand of the forthcoming annexation which, it was asserted by the Austrians, was necessitated by the need ‘for giving Bosnia and Herzegovina some sort of constitution, so that these two Provinces should not remain as the only two Provinces in the whole of Europe which are not in enjoyment of constitutional privileges’. Grey had also had to fend off, for the time being, a Russian request for an international Conference, arguing that this would be premature until there had been some preliminary understanding. The question of the passage of the Straits, he informed his Ambassador in Paris, ‘is one which H[is] M[ajesty’s] Gov[ernmen]t must have time to consider very carefully and for which public opinion in England has hardly had time yet to prepare. Nor do we know yet what objections Turkey may raise to it…’ Ironically, the precipitate Austrian action forced the Russians to reconsider their attitude to the Young Turks — not from any altruistic motive, ‘but rather with the view of strengthening Russia’s position in resisting what she regards as an attack of Germanism on Slav interests.’ As the first step towards a closer understanding, Tcharykov informed Nicolson of a strict secret: that the Russians might waive their claim ‘to further payments by Turkey of the War Indemnity [of 1878]’, although, as a reward for such largesse, the Russians would expect Turkish agreement to some modification of the Treaty provisions concerning the Straits. Unfortunately, when this proposal was dangled before the Turks it did no more than arouse the gravest suspicions; for the Grand Vizier ‘altruism’ and ‘Russia’ were mutually exclusive terms. When news of the Turkish uneasiness was received in the Foreign Office it then turned the spotlight uncomfortably back on the Conference proposal. The conundrum which now presented itself was that the Russians, it was thought, would not attend a Conference which was limited solely to the questions raised by the Austrian annexation and declaration of Bulgarian independence, while the Turks would boycott any Conference at which a modification of the Straits provisions was on the agenda. To try to solve this impasse Tyrrell (Grey’s private secretary), backed by Hardinge, went down a similar route to that taken by the Russians by suggesting a bribe to Turkey in the form of an international guarantee of a foreign loan, to be used for the purpose of internal reform. While admitting that ‘it would be a definite step in favour of Turkey, which would relieve the tension’ the Foreign Secretary preferred to wait to hear Isvolsky’s opinion. Even so, in an indication that the Russian would receive a reasonably tolerant hearing, Grey admitted to the Turkish Ambassador, Rifaat Pasha, that ‘we had felt for some years that the international denial to Russia of all egress through the Straits was a thing which could not be maintained for ever’, although he had not counted on the question being raised so soon. There is little doubt that Grey would eventually have been disposed to accommodate the Russians regarding the Straits question had not events in Turkey taken their recent course. The prospect of a liberal administration in Constantinople, constitutional reform or not, was too good an opportunity to lose by upsetting the new regime over this age-old controversy. But there was a limit to how far he would go, as became clear when Grey anxiously sought to scupper an Austrian proposal for the guarantee of European Turkey’s territorial integrity; this suggestion was altogether too ticklish to entertain. At the time of the Anglo-Russian Convention we had contemplated that, in the course of time, confidence would grow up between England and Russia and make a favourable arrangement possible. But I found that, for instance, the action of Russian Officers in Persia in suppressing the Constitution had created an unfavourable effect on public opinion here…People here would be still further unfavourably impressed if Russia sought advantages to herself from the present crisis in the Near East. If we came to a one-sided arrangement, which people here would argue necessitated an increase of our Naval Force in the Mediterranean, and if we altered an international Treaty very greatly to the advantage of Russia, and to what would be considered our disadvantage, without getting anything in return,—we should be making a concession which it would be very difficult to defend here at this moment. I therefore thought the time was very inopportune. He suggested that, in times of peace, the ingress and egress of the Straits should be open to warships of the riverain Powers of the Black Sea under certain conditions, but that Turkey should make a declaration that, in time of war between Russia and any other Power, the same rights should be given to both belligerent Powers. He explained that it would be impossible to admit ships into the Black Sea in times of peace, since they might, with the connivance of Turkey, establish a naval station there. Anxious to promote a settlement which was at once favourable to Turkey but which would not see Britain and Russia profit unduly, Grey was nevertheless prepared to admit that Isvolsky’s new proposal of equality in time of war did introduce an element of reciprocity and he promised to submit it to the Cabinet. There the matter was left. Memorandum by Sir Edward Grey. H[is] M[ajesty’s] Government agree that the opening of the Straits is fair and reasonable, and in principle they will not oppose it. If the proposal made was that the Straits should be open on terms of perfect equality to all, the proposal would be one to which no exception could be taken. The difficulty arises from the proposal to give Russia and the riverain Powers an exclusive, though limited, right. H[is] M[ajesty’s] Government cannot but feel that the time is very inopportune for securing general assent to such an arrangement. Feeling in England has very much resented the action of Austria; it would be greatly disappointed if Russia, after protesting against Austrian action, apparently used the occasion to secure an advantage for herself which had any appearance of prejudice to the position of Turkey, or altered the status quo to the disadvantage of others. If, on the other hand, there is a cordial cooperation between Russia and England to overcome present difficulties on disinterested lines, the good effect on public opinion here would be very marked and would predispose it to a change about the Straits in a sense favourable to Russia. H[is] M[ajesty’s] Government, however, agreeing in principle that some opening of the Straits is reasonable, cannot refuse to discuss the question. They feel that a purely onesided arrangement, which would give the Black Sea Powers in time of war the advantage of having the whole of the Black Sea as an inviolable harbour from which cruisers and commerce destroyers could issue and retire at will, free from pursuit by a belligerent, is not one for which public opinion in England is prepared or which it could be induced to accept. Any arrangement, therefore, must be one which, while giving Russia and the riverain Powers egress at all times under some such limited conditions as M. Isvolsky has indicated and securing them from menace or the establishment of foreign naval power in the Black Sea in time of peace, would yet contain such an element of reciprocity as would in the eventuality of war place belligerents on an equal footing with regard to the passage of the Straits. H[is] M[ajesty’s] Government would further observe that the consent of Turkey would be a necessary preliminary to any proposal. To put pressure upon Turkey at this moment to make an arrangement which she might regard, however unreasonably, as a menace to her interests would defeat what we believe is the joint object of England and Russia, viz. : to prevent the overthrow of the present Turkish Government, and the confusion and anarchy which would probably result. Grey’s desire to do nothing to upset the Turks was reinforced by the receipt of a private letter from Lowther in which the new Ambassador declared that any special privileges granted to the Russians, ‘given in no matter how restricted a form’, would be fatal to Turkey. Furthermore, according to Lowther at least, since his recent appointment as Grand Vizier the anglophile Kiamil was ‘very firm in the saddle again’ and had consolidated his position while the power of the Committee was ‘somewhat weakening’. All it would take would be the continuation of external troubles to again strengthen the hands of the reactionaries. Not that Grey needed such prompting; he reassured Rifaat Pasha on the 15th that any modification would be solely dependent upon Turkey’s consent. The Foreign Secretary made it clear that, although in principle his Government ‘agreed that the Straits might be opened under proper conditions: which would be safe for Turkey, which would leave Turkey perfectly free in time of war to open or close the Straits as she pleased, and which if Turkey was neutral would not place any of the belligerents at a disadvantage’, he fervently hoped that the Russians would now postpone the question. Similarly, Germany had no wish to upset the equilibrium in the region in view of her large financial and commercial interests in Turkey. and are advocating agreements with Austria and Bulgaria, if they should prove acceptable to Turkey, before the meeting of the Conference, as this would be so much time gained. On the other hand, the Turks are like children. They put forth the most extraordinary proposals — each more impossible than its predecessor. They do this in secrecy, without the knowledge of their Ambassador in London, and their proposals contain neither sense nor logic. I suppose it will work out all right in the end, but they do not seem to see that it is absolutely essential that the question of Bosnia should come before the Conference… Fortunately, also, the season of the year is in favour of peace, as snow must shortly fall in the Balkans and render military operations impossible. I think we shall have a breathing space for about a fortnight now, before further developments occur. In Constantinople the advent of the annexation crisis had coincided with the month of Ramazan so Grand Vizier Kiamil was obliged to convene an informal meeting of cabinet ministers at his home, at which he informed them of his attempts to form an alliance with his Balkan neighbours. The Foreign Office first became aware, in late October, that the Grand Vizier had proposed either a Military Convention or a defensive alliance between Turkey, Serbia and Montenegro, on condition that neither Serbia nor Montenegro could declare war without Turkey’s consent. By early November a draft of the Convention had already been dispatched from Constantinople to Belgrade, along with the hope of the Turks that Greece and Bulgaria would join the alliance at some future date, once the Porte had been satisfied that Bulgaria had made no secret engagement to Austria. Balking at the original condition, debarring the right of declaring war without Turkey’s acquiescence, the Serbs desired that this stipulation should be made reciprocal, so that Turkey could not involve her new found allies in a war to which they had not consented. In addition, the Convention was to apply to Europe only, as the Serbs had no wish to help in the defence of Turkey’s Asiatic provinces. 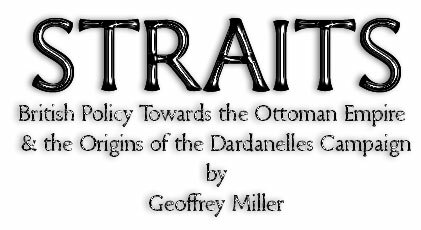 What the Turks stood to gain from these diplomatic manoeuvrings was less than obvious in Whitehall; however, what finally set alarm bells ringing was the realization that the proposed alliance was to be offensive as well as defensive. This Grey would not condone and both Lowther and the British Minister in Belgrade were warned that such an arrangement would be regarded as aggressive and would be disapproved of. On the other hand, the British Government would ‘view with sympathy any arrangement of a purely defensive character, come to by the Balkan States with Turkey for their mutual defence and against possible future encroachments.’ Within days Lowther was reporting back that the proposed Convention had now been dropped, while the negotiations that were still proceeding with Serbia ‘were only intended to provide against the possible contingency of the war party in Bulgaria obtaining the upper hand, and making attack on Turkey.’ Undeterred, Hardinge remained convinced that, if Turkey and Bulgaria could settle their differences and, at the same time, make ‘friendly ententes’ with Serbia and Montenegro, ‘the position of the Balkan States, supported by a friendly Turkey, would be a very strong one, and would practically spell checkmate to Aehrenthal’s policy of obtaining Austria’s supremacy in the Balkans.’ If this could be achieved, he forecast optimistically, then ‘we need [not] have much fear as to the future for some years to come.’ What the Foreign Office did not realize at the time was that, although it suited Aehrenthal to promote the idea that one day Austria might ‘run down to Salonika’, he had in fact no intention of expanding further into the Balkans. Also, Kiamil reported to his colleagues that, although Serbia had been in favour of an alliance, Roumania was opposed and Greece would not be committed; worse, the War Minister informed him that, in the event of the outbreak of hostilities, the army was not in a position to be mobilized. By this time also, the first nascent signs had been noticed of a possible internal reaction against the Constitution. Arabs wondered ‘how far the Constitution was in accordance with the principles of Holy Law’, while the Syrians were apathetic, the Armenians contemptuous, and the Albanians restless. For their part, the Austrians complained of the difficulty in trying to deal with the Young Turks, whom they deemed an ‘irresponsible Body’ that had ‘no official representative at its head to whom the Foreign Powers could make any satisfactory representations’. This difficulty was not confined to them. As Lowther complained, echoing Fitzmaurice’s description, ‘That occult body, the Committee, has from the first worked with great mystery. It had no acknowledged head; occasionally persons crept up who were said to be the leading men, but they disappeared to give way to others. At times we were told that the head-quarters were at Salonica, at others at Constantinople, and then again at Monastir. No individual presided permanently. They seemed to desire to avoid the possibility of any one coming to the fore.’ Added to this, Lowther was now under the impression that the C.U.P. was ‘under the inspiration of the German Embassy’. the Committee, which as a secret body is forbidden by the Constitution, maintained its existence and influence, and its organs planned a determined attack on the Government. Whether this attack is prompted by honest motives or whether it harbours the desire on the part of some of the members of the Committee to occupy positions in the Cabinet now filled by persons who are considered not to be entirely in harmony with the views of the Committee, remains to be seen, and the early days of 1909 will show whether the country is satisfied to be governed by the Moderate party headed by Kiamil Pasha, or by the more advanced section of the Constitutionalists represented by the Committee. However the real breakthrough came on Christmas Day 1908 when Isvolsky made a conciliatory speech in the Duma in which he ‘emphasized the need for community of feeling between the Balkan States and the combination of all three of them with Turkey for defence of common interests.’ Above all, the Russians could not afford to risk war. As Isvolsky later confirmed to Nicolson: Russia ‘was just beginning to bring order into her finances, was reorganizing her army, and internal unrest was quieting down. A war would throw back all the progress effected, and would probably revive all the troubles from which Russia was just emerging’. Then, in January 1909, the Austrians made a three part proposal to the Porte which included a payment of £T2.5 million ‘as a compensation for Turkish crown lands in Bosnia and Herzegovina’ and the prospect of a beneficial adjustment in the Capitulatory regime. The Porte accepted the plan in principle, and the Austro-Turkish Protocol was duly signed at Constantinople on 26 February 1909 leaving Grey with a new worry — his disinclination to discuss any alteration to the Capitulations or customs dues. There still remained the other outstanding issue: the compensation that should be payable by Bulgaria to Turkey following the former’s declaration of independence. Although Grey cautioned prudence, the Turks demanded a sum which varied from 125 to 150 million francs whereas the Bulgarians refused to offer any more than 82 million francs. Having intimated to Nicolson at a party on the evening of 29 January that Bulgaria was threatening ‘recourse to other means’ if the ‘difficulty’ could not be settled, Isvolsky declared that he would go home ‘and see if he could not work out a project which would satisfy Bulgaria and be acceptable to Turkey.’ By 3 a.m., Isvolsky had formed the basis for a novel scheme whose origins lay in the suggestion that had first been mooted some months previously that Russia might forego that remnant of the conflict of 1878 — the annual Turkish War Indemnity payable to Russia. Isvolsky now proposed that Russia should renounce twenty years of the War Indemnity which, he believed, would save the Turks 150 million francs. To reimburse Russia for this sacrifice on her behalf, the Bulgarians would be asked to pay interest at 4 or 4½ per cent., but only on the amount of 82 million francs. By this means the Bulgarians were not paying more than they wanted; the Turks were getting what they asked for; and, being in Russia’s debt, there was a strong chance that Bulgaria would now gravitate towards the Entente Powers rather than the Triple Alliance. For the Grand Vizier the latest Russian proposal, involving as it apparently did another dose of altruism, was to be viewed with deep misgiving. Kiamil Pasha, whose days in office were numbered, suspected that, as part of the deal, the question of the Straits would be forced upon him inopportunely. Grey, who was enthusiastic about the proposal, rushed to reassure the Turks, though, as he himself admitted: ‘The Turks, naturally, will not understand why Russia is putting her hand into her own pocket, unless it be to get something out of the Turks later on.—I suppose that the real reason for Russia’s action is that she wishes to detach Bulgaria from Austria and attach her to Russia.’ The issue of the amount of compensation was to be treated solely on its merits, Grey informed Lowther, adding that he would not have approved of any proposal which was coupled with the question of the Straits. First however, the debate would be temporarily suspended following the political upheaval in Constantinople. Lowther to Grey, private, 25 August 1908, BD, V, no. 209, p. 267. 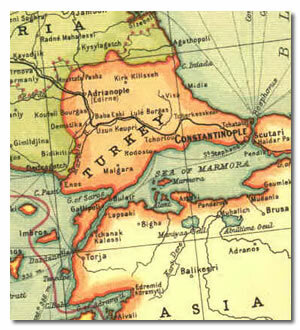 See also, Heller, British Policy, p. 13; Kent, “Constantinople and Asiatic Turkey”, in Hinsley, op. cit., p. 13. Grey to Lowther, private, 23 August 1908, BD, V, no. 208, pp. 266-7. Quoted in, Fitzherbert, Greenmantle, p. 83. Fitzmaurice to Tyrrell, private, 25 August 1908, BD, V, no. 210, pp. 268-70. Fitzmaurice continued in similar vein some months later: ‘[We] were able to advise and guide these people who at first were like children newly born into the world of freedom…’ Fitzmaurice to Tyrrell, private, 11 January 1909, BD, V, no. 211, pp. 270-2. Shaw and Shaw, History of the Ottoman Empire, vol. II, p. 274. Fitzmaurice to Tyrrell, private, 25 August 1908, BD, V, no. 210, pp. 268-70. Memorandum by Ralph Milbanke, 15 February 1898, BD, I, enclosure in no. 367, pp. 296-7. ‘In such an eventuality…Austria should take Bosnia, Herzegovina and the Sanjak, while Russia was admitted to having special interests in the Straits and the country adjacent to Constantinople. Pending a break up of the Turkish Empire the status quo was to be observed.’ Nicolson to Grey, private, 10 November 1909, BD, V, no. 872, pp. 810-1. The Turks were now being ‘extra pleasant to foreigners as they are dependent on [their] sympathy…’ Fitzmaurice to Tyrrell, private, 25 August 1908, BD, V, no. 210, pp. 268-70. Henry Wickham Steed, Through Thirty Years, volume I, p. 291. See, ‘The Buchlau Interview’, Annual Report for Russia for the Year 1908, BD, V, p. 367. Crucially, however, there was to be no compensation for Serbia. Langer, Russia, the Straits Question, and the European Powers, pp. 72-3. Goschen to Grey, private, 14 October 1908, BD, V, no. 381, pp. 445-6. Isvolsky was being disingenuous; he was apparently aware that the annexation would be announced before the Austro-Hungarian Delegations met in Budapest on 8 October. Even so, in an attempt to present the Delegations with a fait accompli, Aehrenthal himself prematurely announced the decision; this was a crass miscalculation. Williamson, Austria-Hungary and the Origins of the First World War, (London, 1991), pp. 68-70. Isvolsky had been unable to see the French Foreign Minister who was out of Paris, shooting. He saw instead the Political Director at the Quai d’Orsay and the British Ambassador that evening. Bertie to Grey, no. 378, confidential, 4 October 1908, BD, V, no. 292, pp. 382-3. The Austrian Ambassador in Paris had been informed of the impending annexation on 1 October by Aehrenthal and had been further instructed not to deliver the message to the French President before 5 October; however, as the President was due to depart from Paris, the Ambassador ignored his instructions. Henry Wickham Steed, Through Thirty Years, volume I, pp. 292-3. Aehrenthal declared to the British Ambassador: ‘I give you my solemn word of honour that I had no idea that the declaration of Bulgarian independence was so imminent. I knew that it must come in the near future, in a few weeks perhaps, but that it should have been made so soon was a complete surprise to me.’ However, as Goschen commented, ‘When a man gives you his word of honour one has to accept it, and there was nothing more to be said. But, from putting two and two together I am pretty sure in my mind that his word of honour only extended perhaps to the precise date. He could easily have arranged that he shouldn’t know this, and so have provided for future contingencies and the squaring of his conscience.’ Goschen to Grey, private, 14 October 1908, BD, V, no. 381, pp. 445-6. This discounts the theory that Aehrenthal’s fait accompli was so designed to catch Isvolsky out before the consent of his Entente partners had been obtained. Nicolson to Grey, no. 184, confidential, 5 October 1908, BD, V, no. 303, pp. 390-1. ‘The Buchlau Interview’, Annual Report for Russia for the Year 1908, BD, V, p. 367. Hardinge to Nicolson, private, 30 September 1908, BD, V, no. 274, p. 370; Bertie to Grey, no. 380, confidential, 4 October 1908, BD, V, no. 293, pp. 384-6. Memorandum respecting an Interview between Sir C. Hardinge and Count Mensdorff, Foreign Office, 3 October, 1908, BD, V, no. 287, pp. 377-8. The Times, London, 8 October 1908, quoted in, Langer, Russia, the Straits Question, and the European Powers, p. 77. Grey at first maintained to the French that the Turks had suffered no material loss. When the Austrians used this same argument to him, Grey suddenly remembered that there had been a tribute payable to the Turks from Eastern Roumelia so that ‘one could hardly say that there was no material loss to her in the sweeping away for ever of this claim without compensation’. Grey to Bertie, no. 477, 5 October 1908, BD, V, no. 306, pp. 392-3; Grey to Lascelles, no. 281, 9 October 1908, BD, V, no. 350, pp. 419-20. Grey to Bertie, no. 477, 5 October 1908, BD, V, no. 306, pp. 392-3. Marginal note by Kaiser Wilhelm, quoted in Sir Sidney Lee, King Edward VII, (2 volumes, London, 1927),volume II, p. 638. Bertie to Grey, no. 58, pressing, 6 October 1908, BD, V, no. 311, p. 395. Wilfred Blunt recorded cynically but presciently on 10 October, ‘What will probably happen is that a conference will be proposed which will come to nothing. Then either there will be an acceptance of the fait accompli, public opinion in England having got tired of the thing, or there will be a war of coercion.’ Blunt, My Diaries, vol. II, pp. 223-4. Grey to Bertie, no. 156, 6 October 1908, BD, V, no. 314, p. 396. Nevertheless, the French remained extremely nervous for some days, fearing that war would break out, and calmed down only after being reassured by the ‘prudent attitude’ of the Turkish Government. Bertie to Grey, no. 390, 7 October 1908, BD, V, no. 333, pp. 408-10; Bertie to Grey, no. 60, en clair, 8 October 1908, BD, V, no. 335, pp. 412-3. Nicolson to Grey, private, 8 October 1908, BD, V, no. 334, pp. 410-1. Lowther to Grey, no. 304, confidential, 8 October 1908, BD, V, no. 338, p. 414. Minute by Hardinge on Lowther to Grey, no. 304, confidential, 8 October 1908, BD, V, no. 338, p. 414. Grey to Lascelles, no. 282, 10 October 1908, BD, V, no. 355, p. 423. Grey ‘remarked that one had to be very careful, in proposing remedies for a situation such as this, not to put forward anything which might raise still further questions…’ The Germans made a similar proposal some days later: Lascelles to Grey, no. 54, 13 October 1908, BD, V, no. 367, p. 432. Metternich to the Foreign Office, 9 October 1908, quoted in Sir Sidney Lee, King Edward VII, (2 volumes, London, 1927),volume II, p. 639. Similar regulations already existed for the Russian Volunteer Fleet: see, Grey to Lowther, no. 434, 15 October 1908, BD, V, no. 383, pp. 447-8. Grey complained that this new proposal was an advance over the one that had been discussed at the time of the Anglo-Russian Convention. Grey to Nicolson, no. 318, secret, 14 October 1908, BD, V, no. 379, pp. 442-4. See also, Grey, Twenty-Five Years, Vol. I, pp. 183-5. D W Sweet, “The Bosnian Crisis”, in Hinsley (ed. ), op. cit., p. 181. Hardinge to Nicolson, private, 13 October 1908, BD, V, no. 372, pp. 434-6. Hardinge commented: ‘There may be some truth in all this, but I think that, at the bottom of it all, is the very strong desire to be able to show the world that he has not been entirely duped by Aehrenthal.’ Ibid. ; see also, Hardinge to Nicolson, private, 28 October 1908, BD, V, no. 414, pp. 471-2. Grey to Nicolson, no. 318, secret, 14 October 1908, BD, V, no. 379, pp. 442-4. Grey to Nicolson, private, 26 October 1908, BD, V, no. 409 (b. ), pp. 468-9. Much to the annoyance of the King, who feared that, without a concession, Isvolsky would be discredited and forced to resign. He hoped that the Cabinet ‘are looking at this question from a European and International point of view and not from merely a domestic one.’ Sir Sidney Lee, King Edward VII, (2 volumes, London, 1927),volume II, p. 640. Grey to Nicolson, no. 317, 12 October 1908, BD, V, no. 364, pp. 429-30. See also, Grey, Twenty-five Years, Vol. I, pp. 173-5. Grey to Nicolson, no. 484, 12 October 1908, BD, V, no. 358, p. 424. Grey to Nicolson, no. 317, 12 October 1908, BD, V, no. 364, pp. 429-30. Hardinge to Nicolson, private, 13 October 1908, BD, V, no. 372, pp. 434-6. For what it was worth, Isvolsky also observed that the French Press ‘were entirely on the side of opening the Straits’: Grey to Nicolson, no. 324, 13 October 1908, BD, V, no. 371, pp. 433-4. The latest proposal touted by the French Press was for an arrangement based upon the Suez Canal Convention ‘which provides for a free passage even for belligerents on the condition that they make no stay in the canal; that they commit no warlike acts and that they take in only a minimum of coal’. Bertie to Grey, no. 398, 12 October 1908, BD, V, no. 365, pp. 430-1. Hardinge to Nicolson, private, 13 October 1908, BD, V, no. 372, pp. 434-6. Hardinge added: ‘I should be glad if this could be settled satisfactorily to-morrow, as it would save Isvolsky’s position, and possibly also our entente. He should also be grateful to us for the support we should give him, especially as we shall not ask for any compensation from Russia such as he, in his memorandum of last year, agreed should be given’. Memorandum by Sir Edward Grey, 14 October 1908, BD, V, no. 377, p. 441. Hardinge to Nicolson, private, 28 October 1908, BD, V, no. 414, pp. 471-2. Grey to Isvolsky, private and confidential, 15 October 1908, BD, V, no. 387, pp. 451-2. Lowther to Grey, private, 13 October 1908, BD, V, no. 375, pp. 439-40. Lowther warned: ‘A failure to get some satisfaction for Turkey would increase their numbers [the reactionaries] enormously and the temptation might be offered to go to war rather than face internal difficulties. What is probably at the back of the minds of most of the population is that they must fight Bulgaria some day but they want to choose the moment’. Grey to Lowther, no. 434, 15 October 1908, BD, V, no. 383, pp. 447-8. Lascelles to Grey, tel. no. 56, 14 October 1908, BD, V, no. 376, p. 440; Lascelles to Grey, no. 454, 15 October 1908, BD, V, no. 386, pp. 450-1. ‘Germany,’ the Grand Vizier declared, ‘was naturally in favour of financial compensations as this would furnish guarantees for the Bagdad Railway.’ Lowther to Grey, no. 327, 15 October 1908, BD, V, no. 382, p. 447. Grey to Lowther, tel. no. 358, 16 October 1908, BD, V, no. 388, pp. 452-3. The Grand Vizier had already expressed his deep disappointment ‘at the idea of the Cretan annexation to Greece being sanctioned by Powers at a Conference and he would rather Crete should be occupied by Great Britain like Cyprus than that it should go to Greece. He added that if Crete were annexed to Greece separatist tendencies would permeate the Turkish islands in the Aegean Sea.’ Lowther to Grey, no. 327, 15 October 1908, BD, V, no. 382, p. 447. Grey to Lowther, no. 113, 15 October 1908, BD, V, no. 384, p. 449. Nicolson to Grey, no. 457, 16 October 1908, BD, V, no. 391, pp. 454-5. Note: although written on 16 October this dispatch was not received in London till the 26th. Langer, p. 85. See also, Taylor, Struggle for Mastery, pp. 451-2; D W Sweet, “The Bosnian Crisis”, in Hinsley, op. cit., pp. 180-2. On 26 October the Grand Vizier had submitted a proposal, ‘which he does not wish should be known to Turkish Embassy in London’, that Bosnia should become an independent Principality ‘governed by a Protestant Prince belonging to some neutral State, selected by the Powers and facilitated by Turkey.’ Lowther to Grey, no. 365, secret, 26 October 1908, BD, V, no. 404, p. 464. Whitehead to Grey, no. 19, 26 October 1908, BD, V, no. 405, p. 465. Whitehead to Grey, no. 83, confidential, 10 November 1908, BD, V, no. 440, pp. 492-4. As Whitehead in Belgrade made clear: ‘…in the case of a Bulgarian advance into Macedonia Servia could be paralyzed by Austria, and Turkey would in these circumstances be unable to assist her allies.’ Ibid. Lowther to Grey, tel. no. 365, secret, 26 October 1908, BD, V, no. 404, p. 464; Grey to Whitehead and Lowther, nos. 43 and 440, 14 November 1908, BD, V, no. 447, p. 498. Lowther to Grey, no. 394, 16 November 1908, BD, V, no. 449, p. 499. Hardinge to Bryce, private, 4 December 1908, quoted in, Heller, British Policy towards the Ottoman Empire, p. 19. Crampton, Hollow Detente, p. 37. Feroz Ahmad, The Young Turks: the C.U.P. in Turkish Politics, 1908-1914, (Oxford, 1969), p. 24. Annual Report for Turkey for 1908, BD, V, p. 258. Hardinge to Nicolson, private, 25 November 1908, BD, V, no. 464, p. 511. Grey to Lowther, tel. no. 213, 14 December 1908, BD, V, no. 485, p. 530; D W Sweet, “The Bosnian Crisis”, in Hinsley (ed. ), op. cit., p. 179. Hardinge to Nicolson, private, 6 December 1908, BD, V, no. 476, pp. 520-1. Cartwright to Grey, no. 213, confidential, 11 December 1908, BD, V, no. 484, pp. 527-30. Annual Report for Turkey for 1908, BD, V, p. 259. Lowther to Grey, 14 December 1908, quoted in, Adelson, London and the Invention of the Middle East, p. 70. Comprising: 142 Turks, 60 Arabs, 25 Albanians, 23 Greeks, 12 Armenians, 5 Jews, 4 Bulgarians, 3 Serbs and 1 Vlach. The C.U.P. could count on the support of 60 deputies. Mansel, Constantinople, p. 348. Though, according to some Turkish accounts, the Sultan waved to the crowds from his carriage: Shaw and Shaw, History of the Ottoman Empire, vol. II, p. 278. Mark Kerr, Land, Sea, and Air, p. 128. Annual Report for Turkey for 1908, BD, V, pp. 259-60. Nicolson to Grey, no. 194, 24 March 1909, BD, V, no. 761, pp. 732-3. ‘We shall no doubt be shortly asked to assent to the Custom Increase’, Mr Maxwell, the Senior Clerk, wearily minuted. Lowther to Grey, no. 7, 11 January 1909, BD, V, no. 510, p. 562; Cartwright to Grey, no. 29, 27 February 1909, and minutes by Tilley, Maxwell and Mallet, BD, V, no. 622, pp. 638-40; Cartwright to Grey, no. 76, 17 March 1909, and minutes by Maxwell and Mallet, BD, V, no. 700, p. 694. Grey to Lowther, no. 63, 2 February 1909, BD, V, no. 548, pp. 584-5; Lowther to Grey, no. 77, 6 February 1909, BD, V, no. 562, pp. 593-4. One Turkish pound was worth approximately 23 francs. Nicolson to Grey, no. 72, 30 January 1909, BD, V, no. 542, pp. 581-2. This amounted to £T350,000 (8 million francs) per year. Grey to Cartwright, private, 2 February 1909, BD, V, no. 551, p. 586. Grey informed the Turkish Ambassador: ‘The Russian proposal stood by itself. It would receive our support and that of the other Powers as a clean bargain, on its own merits, and I did not see how any other construction could be placed upon it afterwards.’ Grey to Lowther, no. 45, 2 February 1909, BD, V, no. 552, pp. 586-7. If this made the Turks more amenable, the only seeming snag left became apparent when it was found that Isvolsky had not done his sums correctly, and that the 20 years renunciation of the War Indemnity could only be capitalized at 120 million francs. Nevertheless Grey directed that it should be made clear to the Grand Vizier that, if the Powers were to act as Kiamil suggests, ‘and to fix an equitable sum and impose it both on Turkey and Bulgaria he could not possibly hope to obtain more than 100 million francs, since all the Powers, with the exception of England, are agreed that this sum would be adequate compensation and as much as the Bulgarians are in a position to pay. It is moreover not certain that the Bulgarians would, except under extreme and united pressure, agree to pay even this sum. The fact that Turkey would receive at least an additional twenty million francs has been the deciding factor with H[is] M[ajesty’s] Gov[overnmen]t in their approval of the Russian proposal, and I see no other way of obtaining so large an amount of compensation.’ The Russian proposal was debated by the Turkish Cabinet from the moment when it was received officially on the afternoon of 5 February until midnight that night. While not rejecting the proposal outright, the Turks counter-proposed that, instead of being suspended for 20 years, the War Indemnity (which was still due for 74 years) should be abandoned for all time! Grey to Lowther, tel. no. 63, 2 February 1909, BD, V, no. 548, pp. 584-5; Lowther to Grey, no. 77, 6 February 1909, BD, V, no. 562, pp. 593-4.